Summer doesn’t spare anyone and this is a bitter truth! Every time the season arrives, it robs our skin’s natural glow, making it dull and lustreless. 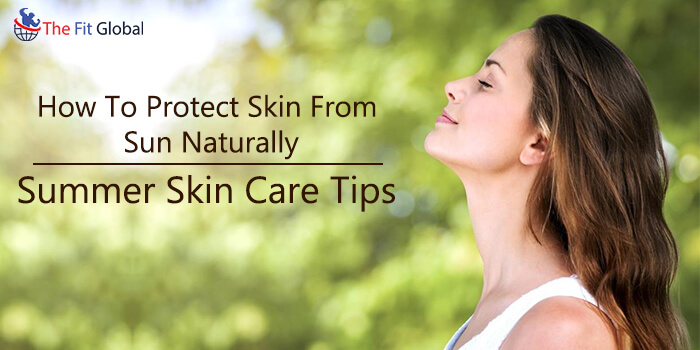 But, with some right and easy to follow summer skin care tips, you can become a pro in knowing how to protect skin from sun naturally. Here comes a perfect guide book that you can follow to make your skin soft, supple and glowing! To put everything in simpler terms, here are the three simple yet worthiest rules that this summer skin care guide book speaks about! With the right kind of nourishment and some quick tips that make our skin appear glossy and charming, it is quite an easy task to make a style quotient this sizzling summer! Let’s start with the foods that save our skin from the scorching heat! It would be a misconception if you feel that the secret of flawless skin for most of the celebrities in the beauty industry is only make-up! Attaining a soft and glowing skin is not just an external affair! Without nourishing your body with rich antioxidants, vitamins, and minerals, it is merely impossible for us to meet our healthy skin goals. So, here are the topmost vitamins and minerals that can protect your skin from sun damage! A. Vitamin C To Get Sun Kissed Look! This is because antioxidants can fight the free radicals that cause damage to the healthy skin cells when we go out in the sun. Vitamin C also boosts the production of collagen which is essential for maintaining the elasticity of the skin, which ultimately gives our skin a natural glossy look. How Do I Get My Vitamin C? There are plenty of fresh fruits and vegetables that are a rich source of vitamin C and it is quite easy to include them into your diet. Make sure that your plate is loaded with broccoli, tomatoes, kale, spinach, Brussel sprouts, cabbage, thyme, and parsley. The next time you feel an urge to gratify your sweet tooth, dodge the sugary sweets and indulge in fresh and sweet snack fruits like oranges, limes, cherries, guavas, kiwis, strawberries and lychees. B. Vitamin E To Prevent Sun Damage! How Do I Get My Vitamin E? The availability of vitamin E is abundant. You have a wide range of foods that offer vitamin E (some of the sources offer more than 100% of the daily requirement). The recommended intake of vitamin E is 15 mg per day which can be fulfilled by consuming some healthy nuts and seeds, fresh fruits and vegetables. You can carry a handful of these nuts and seeds to munch on them during your snacking time! 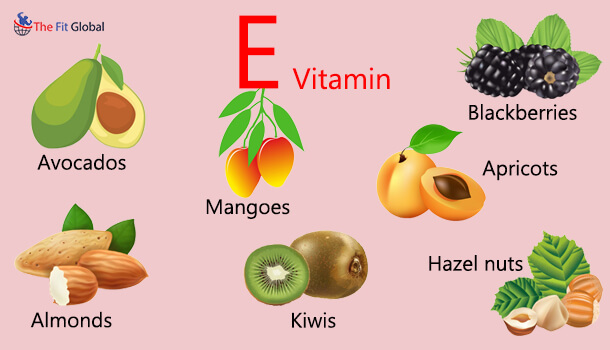 Ensure that you consume more fruits like avocados, mangoes, kiwis, blackberries, cranberries, raspberries, olives and apricots to gain plenty of vitamin E.
Cooking oils are the best source of vitamin E and you will be surprised to know that just 100 grams of these oils fulfil more than 100% of your daily vitamin E requirement. Sunflower oil, rice bran oil, almond oil, palm oil, grapeseed oil, hazelnut oil, wheat germ oil, cottonseed oil, canola oil are the best sources of vitamin E.
C. Consume Zinc Rich Foods – Eat Your Sunscreen! The antioxidant properties of the mineral make it a perfect and natural sunscreen! How Do I Get My Zinc? Having some boiled sweet potatoes for your breakfast can help you meet 4% of daily zinc requirement. 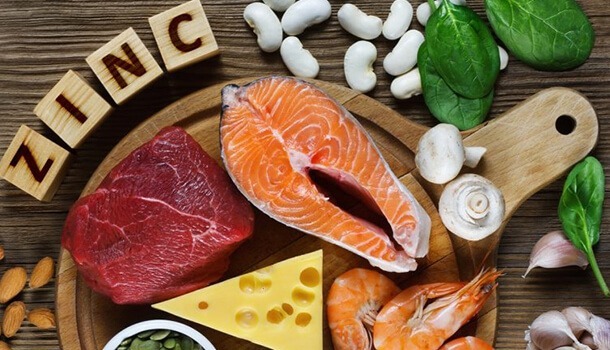 You can meet your daily zinc requirement by consuming other zinc-rich foods like avocados, spinach, yoghurt, mushrooms, pumpkin seeds, pine nuts, pecans, fortified breakfast cereals, eggs, lentils and beans and whole grains. Relishing a bar of dark chocolate which weighs around 101 grams fulfils 22% of your daily zinc requirement. Best Zinc Sources For Meat Eaters! Lamb, pork, chicken, oysters, beef are all a good source of zinc. RDA here refers to recommended dietary allowance. 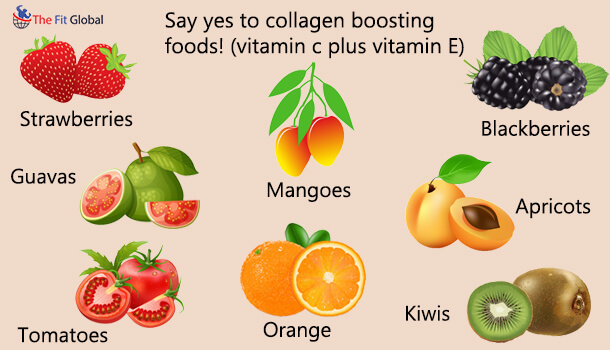 D. Say Yes To Collagen Boosting Foods! Collagen is a kind of protein that is found in skin and other connective tissues. The protein plays a vital role in retaining our skin’s smoothness and elasticity! This is because the cells in collagen are packed together tightly making it a hard and fibrous in nature. What Does Sunlight Do To The Collagen In Your Skin? 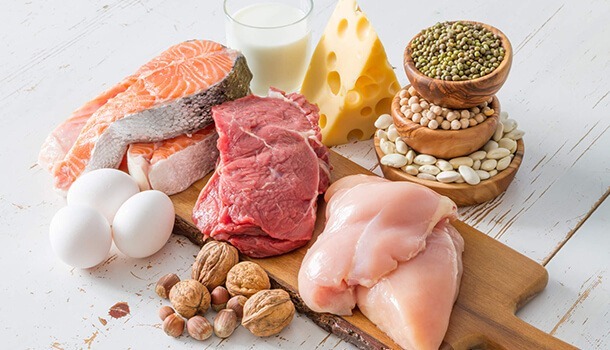 The production of this protein decreases with the increase in age! Sometimes, it is the ultraviolet radiations that damage the collagen which makes our skin look worn out and wrinkled too soon. Protecting your skin while going out into the sun is one way to retain your skin’s collagen but changing your dietary habits and including more collagen boosting foods into your diet is the best and natural way to make your skin lively and gorgeous! How Do I Procure Collagen? Our body needs certain nutrients for proper synthesis of collagen. Nourishing your body with these vitamins and minerals can prevent the collagen deterioration. Research has proved that vitamin C can produce collagen in both young and aged human skin. 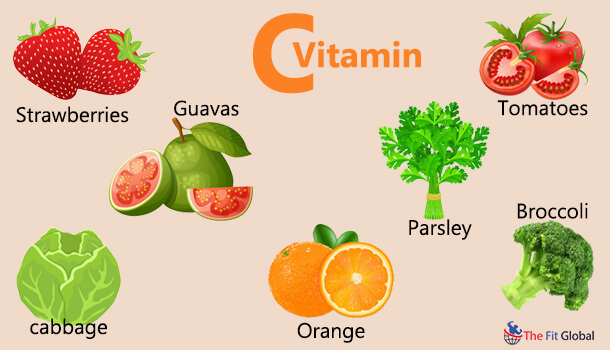 5 You can refer to the above-mentioned vitamin C rich foods to supply your body with enough of the vitamin. Leafy greens are also the best sources of chlorophyll which carries antioxidant properties, apart from providing collagen. Not all fats are harmful! Omega-3 fatty acids are a kind of unsaturated fatty acids that are primarily available in fish oils and most of the nuts and seeds! The reason why these healthy fats can protect your skin is they are anti-inflammatory in nature! This prevents your skin from any kind of skin allergies or damage which could be caused due to the exposure of your skin to the sun. Now that you know what to consume as a skin-friendly diet, let us speak about the simple yet most crucial tips one must follow to safeguard the skin from the blistering heat. A. Never Ever Forget To Apply Sunscreen! When it comes to suggesting the best summer skin care tips, one cannot simply get away without suggesting the application of sunscreens! In fact, this is the most basic and primary tip that should be the part of your summer skincare regime! No matter how many summer skin care tips we follow, nothing can be as befitting and beneficial as drinking water. In fact, water plays a major role in keeping up the efficacy of each and every cell in your physiological system. Dry and worn out skin is the most common complaint of the ones whose body is depleted of water! A Trick To Keep Your Skin Hydrated! Initiation is the primary step of anything that you have thought of accomplishing. Initiate by setting a goal of drinking 2 liters of water in a day. Set an alarm for every half hour or one hour to drink water because it is often when we are too busy that we forget to take proper care of self. Ensure that you have reached your target successfully by the end of the day! C. Wear Long-Sleeved Dresses – Follow The Summer Dress Code! Make up your wardrobe and get ready to change your style statement this summer! Ensure that you put on long sleeved clothes when you go out in the sun. The best way to prevent sunburns is to ensure that your skin is totally covered and protected from harmful ultraviolet radiations. A hat, a muffler and a pair of sunglasses should be an important part of your summer dress code! There is nothing more refreshing and rejoicing than pampering your skin when you finally get some free time off your busy schedules! But, the good news is that you no longer have to visit your beauty salons to relax. 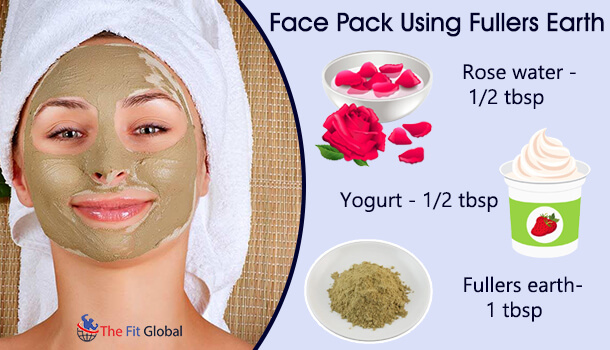 Here are some amazing homemade summer face packs you can prepare at your home. Mix the quantities of turmeric and yoghurt together and squeeze fresh lime into it. 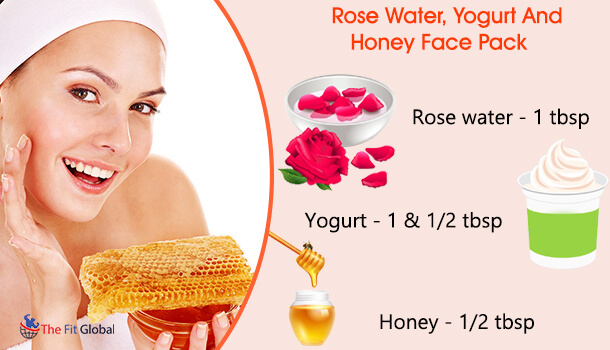 Apply the face pack all over your face and neck and massage it well for 5-10 minutes. Leave it as such for half an hour before you rinse it off with cold water! Add honey into the yoghurt before you finally add rose water. Mix all the ingredients well until a smooth paste is formed. Apply the face mask using a brush or your fingertips and massage it well into your skin pores. Let the mixture get completely dried, after which you can rinse it off and pat dry. Fuller’s earth is one of the best beautifying agents that enhances the skin texture and brings a remarkable change to your skin. A gradual application of the ingredient can undoubtedly bring glow and glimmer to your skin. 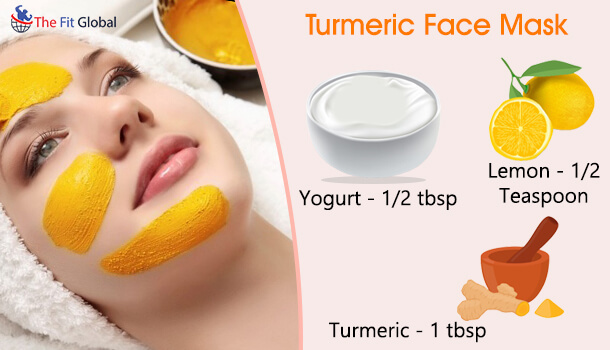 Mix the ingredients well and apply a fine layer of face pack using a brush. Wait until it is completely dried and rinse it off with cold water. You will instantly witness a change in your skin texture and complexion! The answer to the most bothering question of how to protect skin from sun naturally comes in the form of three major rules! Taking care of your dietary habits, following certain summer skin care tips before you step out of the door and applying some skin-friendly face packs twice a week! Consume foods that are rich in Vitamin E, Vitamin C apart from zinc-rich foods, foods that contain healthy fats and more importantly, foods that boost collagen! Keep drinking water at regular intervals to prevent excessive skin dryness and do not forget to guard your skin with the sunscreen before you step out to face the sizzling summer.